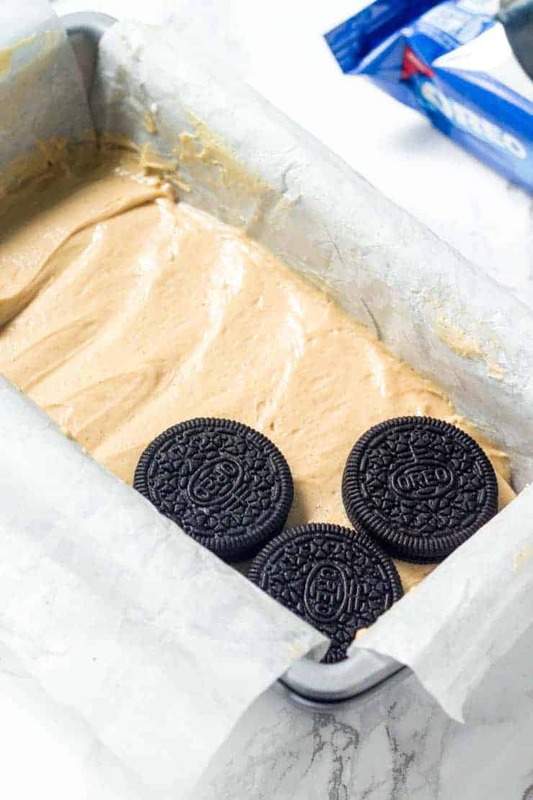 Peanut Butter Oreo Icebox Cake is the perfect no bake summer treat. Cold, creamy peanut butter goodness! Cookies and cream meets Reese’s Peanut Butter Cup. This is a peanut butter chocolate dessert that will soon become a new favorite dessert! We love easy desserts – especially the no bake kind! This icebox cake is the newest addition to our no-bake dessert collection. Some of our other favorites include our Ice Cream Sandwich Cake, No-Bake Oreo Cream Pie and No Bake Peanut Butter Oatmeal Bars. Today I’m sharing this easy peanut butter Oreo icebox cake. It’s basically a homemade peanut butter ice cream cake that’s smooth, creamy and stuffed with layers of Oreo cookies. 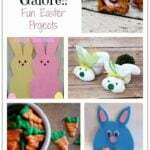 And best of all – it takes under 15 minutes to prepare. Ps – it’s Fiona from Just So Tasty stopping in. This summer, icebox cakes have been my go-to dessert. They’re so easy to make, completely no bake, and no one can turn down a slice. Whether it’s a lemon icebox cake or s’mores icecream cake – no bake desserts are perfect for summer. 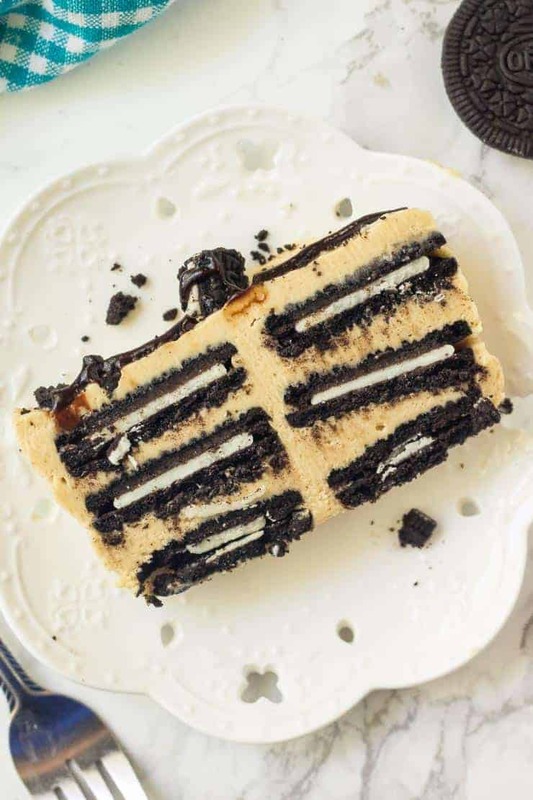 And since peanut butter is probably my favorite thing on earth – it was definitely time to make this peanut butter Oreo icebox cake. 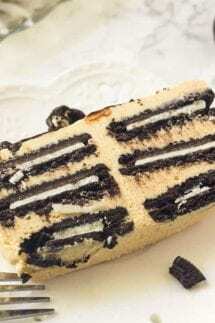 It has layers of creamy peanut butter filling, alternating with layers of Oreo cookies. It basically tastes in between a peanut butter cheesecake and a peanut butter ice cream cake – which is a very good thing. For this peanut butter icebox cake – we’re making it in a loaf pan. I used an 8 inch loaf pan, but a 9 inch pan will work just fine too. First beat the whipping cream until stiff peaks form. If you prefer whipped topping (such as cool whip) feel free to use it instead. Then in a separate bowl beat together the cream cheese, peanut butter and powdered sugar. Last but not least, mix the whipped cream into the peanut butter mixture. From there, it’s time to assemble. Line the loaf pan with 2 sheets of parchment paper (or aluminum foil) so that there’s an overhang on each side. Then alternated between adding a layer of Oreo cookies with a layer of peanut butter filling. Feel free to use whatever variety of Oreos is your favorite – plain, peanut butter or double stuffed work perfectly. Before adding each Oreo cookie, it gets dipped in a little milk first to soften the cookies. This step is super important so that you can easily slice the cake. Then it goes in the freezer to harden for about 4 hours (or more). You can also let it set in the fridge if you prefer a softer consistency, instead of a consistency that’s more like ice cream. Then for the toppings!!!! You can either add the toppings right before serving, or do it ahead of time. I like to add crushed Oreos, peanuts & chocolate sauce. But it’s totally up to you. 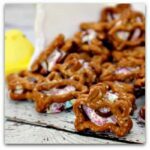 Peanut butter cups, Reese’s Pieces, or chocolate chips are also delicious options. 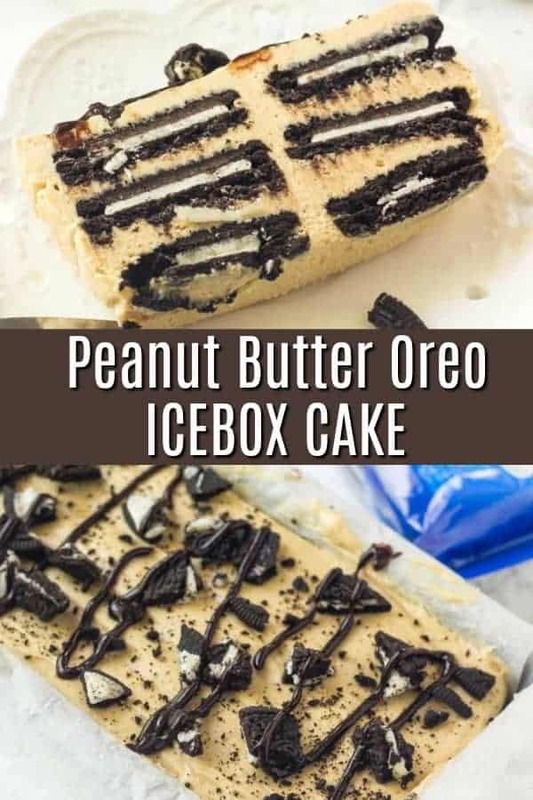 This peanut butter Oreo icebox cake is such a delicious treat for summer, or whenever you’re looking for an easy no bake peanut butter treat. With peanut butter, whipped cream, Oreo cookies and chocolate sauce – you really can’t go wrong! 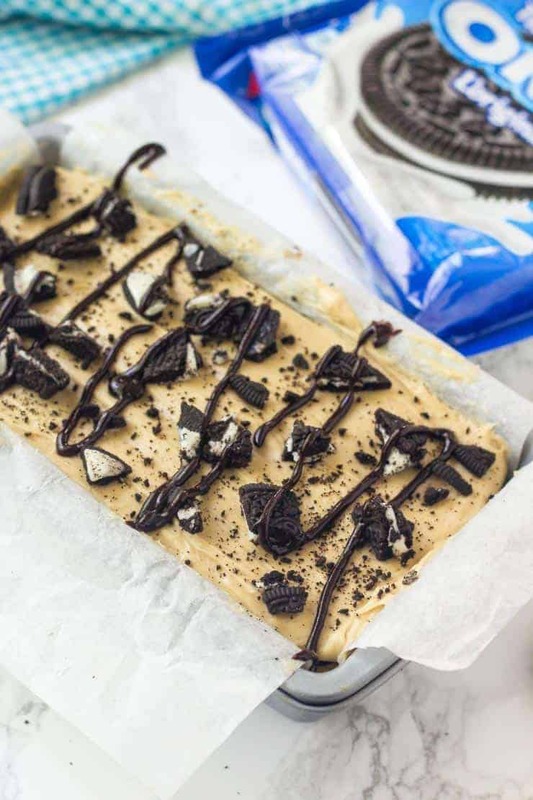 Peanut Butter Oreo Icebox Cake is the perfect no bake summer treat. Cold, creamy peanut butter goodness! Line a loaf pan with parchment paper or aluminum foil, leaving an overhang on each side. Beat the whipping cream until stiff peaks form. In a separate bowl beat the cream cheese, powdered sugar, and peanut butter until smooth. Beat in the whipping cream. To assemble the cake, dip each Oreo in milk first. Place a layer of Oreo cookies into the bottom of the pan, then spread about 1/3 of the butter (about 1 cup) on top. Repeat with a layer of Oreos dipped in milk, followed by about 1/3 of the batter. Repeat with another layer of Oreos & the rest of the peanut butter filling. Place in the freezer to set for 4 hours. Top with crushed Oreos, chocolate sauce, peanuts, or whatever toppings you prefer. 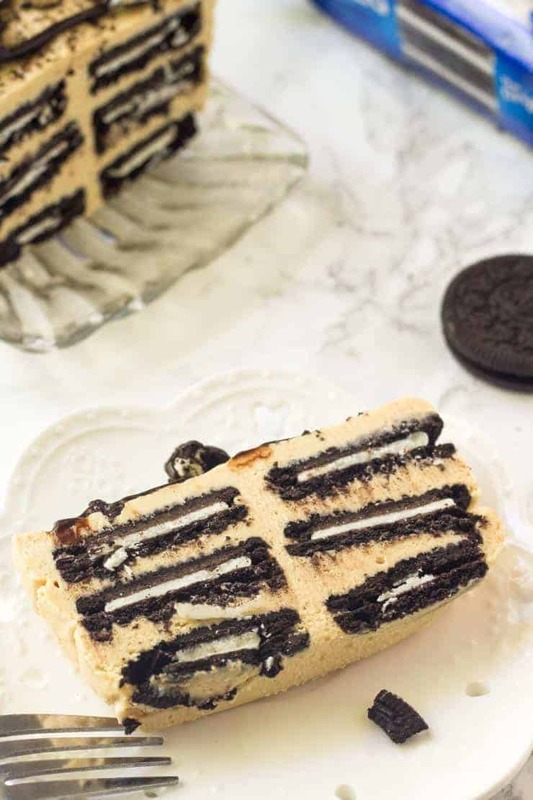 I don’t even have words for how incredible this Oreo icebox cake looks! All that peanut butter cream…wow. Adding this to the must make list! OMG! This is over-the-top delicious looking and sure to satisfy all my chocolate peanut butter cravings. Since it’s still hot here in Florida this will fit right into my dessert plans.